If you’re headed out on a boat to enjoy some water recreation, then you’ve got to have a life jacket available to you. The best life jackets are not only highly affordable today, but can help to get your head above water in some of the roughest of seas. 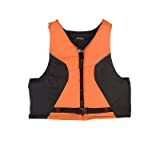 It’s against the law in many jurisdictions to not have a life jacket on a boat, so if you need one for fishing, kayaking, or for any other water recreation, here is the place to look. Whether you want the best inflatable life vest or you’re just looking for something as a swimming assist while you kayak, some vests are better than others. This chart will help you find the best of the best that will meet all your needs today. What Are the Basics of the Best Life Jackets? If you are in a recreational vessel out on the water, then you need to have a life jacket, also called a Personal Floatation Device (PFD) available for every person who is on the boat. The life jackets must meet minimum standards that are set by the governing agency of that country and have these three specific features to be a legal life jacket. It must be the proper size for the person who would need to wear the life jacket in an emergency. It must be in a good enough condition that it can be safely used during an emergency situation. It must either be worn by the person or properly stowed in a place that is readily accessible. Any child under the age of 13 in the United States is required to wear a life jacket at all times unless they are in an enclosed cabin or below deck. Some jurisdictions have different requirements, so before enjoying a day of water recreation, it is important to check with the local boating authority for specific requirements. The first step in this process is to select the right make and model that you prefer. That’s where these life jacket reviews can really help you out. By taking the heavy lifting off of your to-do list, you’re free to select from the best of the best instead of weeding out the life jackets that just don’t make the grade. You’ll then need to make sure that the life jacket you want is rated for your size and weight. If it does, then the next step is to try on the jacket. It must be able to properly fasten. This is where having a unique body shape or type can make the shopping process a little difficult. You will know if it is the right fit because when you lift your arms above your head, it won’t ride up to your chin or face. For those who are strong swimmers, the best inflatable life jacket might be a good solution. They’re not a good idea for immersion sports, but they could be perfect for swimming. It only takes a couple of seconds to put on a life jacket of any style and that could be what saves your life. Expect prices from $30-$100 today on Amazon and similar websites for the best life jackets. 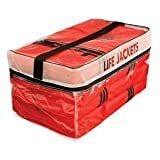 These are highly affordable Type II life jackets that will help to keep your head afloat if an emergency occurs for some reason. This pack actually contains four adult sized jackets and it comes with a carry bag that has been approved as a place for appropriate storage. They aren’t fancy by any means – these jackets are the standard orange foam-based type. They aren’t designed for the waters that are far offshore, but they will help keep everyone safe when an afternoon on the lake is what is on the agenda for the family. This is one of the best life jackets available today for those who love paddle sports. The armholes are a little larger than normal so that wearers will get a full range of motion without the chafing that a standard life vest might wind up providing. The front of the jacket zips up nicely and there are side-adjustment locks included with the design so that it can provide a snug, comfortable fit. It’s available in two standard colors and has ripstop nylon on top of PE foam for a Type III floatation experience. This inflatable life vest is comfortable, lightweight, and slender. Many of the best life jackets will keep you afloat in an emergency, but they definitely make you sweat on a warm day. That’s not the case with this inflatable life jacket. All users need to do is pull a T-cord and the vest will inflate. It’s strong enough to resist the punctures that can sometimes happen while fishing and the reflective piping will help someone see you in an emergency. It’s not good for open waters, but the inland lake or the fly-fishing river? Absolutely. This is your standard Type II life jacket. It fits around your head like a collar and has a universal fit so that many different people can wear it without difficulty. Unlike other models, however, this particular PFD isn’t as bulky and that makes it nice and comfortable. It won’t handle the rough seas, but it will let you safely enjoy the calmer waters that can be found inland. If you’re looking for inflatable life vest reviews or just the best life vest for your body type, these tips will help locate the best jacket at the best price. Don’t risk a fine… or your life. It’s just not worth it when all you do is save a few bucks.